Olfactory sensory neurons project to glomeruli in the olfactory bulb, where they form synapses with two classes of projection neurons: tufted cells and mitral cells. The output of these cells is tuned by several classes of interneurons, including periglomerular cells, external tufted cells, granule cells, and short axon cells. These interneurons can exert different effects on mitral and tufted cells, enhancing the ability to discriminate odors over a range of concentrations (Gschwend et al. 2015 Nat Neurosci 18:1474; Geramita et al. 2016 eLife 5:e16039). Chrna2 is expressed selectively in GL-dSACs (green) in the olfactory bulb. See Burton et al. for details. 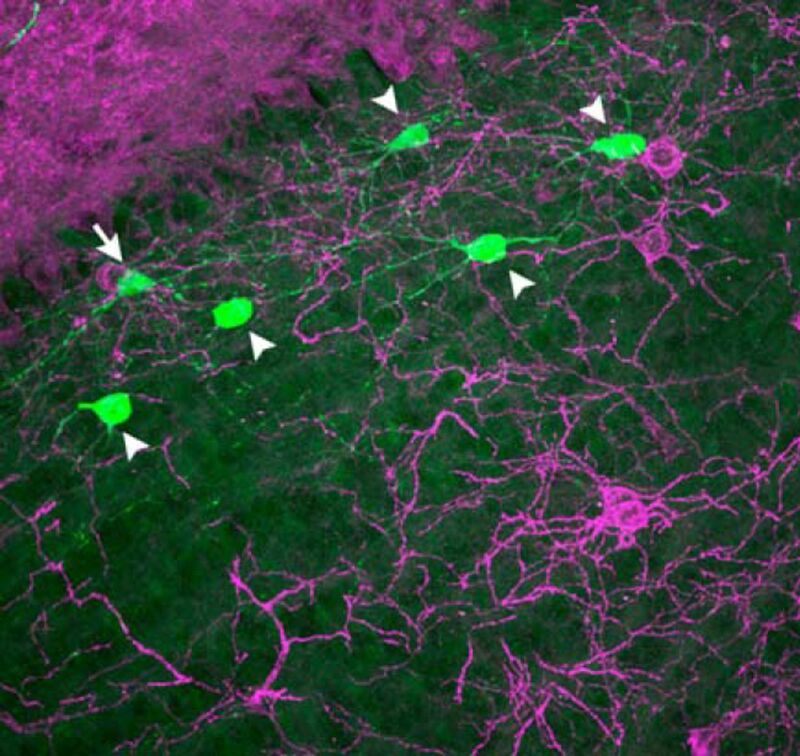 How short axon cells residing in deep layers of the olfactory bulb affect odor processing has remained unknown, primarily because selectively manipulating these neurons was impossible. Burton et al. began to remedy this problem with their discovery that the nicotinic acetylcholine receptor α2 subunit (chrna2) is expressed selectively in the subset of deep short-axon cells that project to the glomerular layer (GL-dSACs). Selectively labeling chrna2-expressing neurons allowed the authors to investigate GL-dSAC morphology, electrophysiology, and connectivity in mouse brain slices. GL-dSACs were spontaneously active, firing regularly at ∼6 Hz (theta frequency) even after glutamate and GABA receptors were blocked. When sensory afferents to single glomeruli were stimulated, GL-dSACs up to several hundred micrometers away showed short-latency, brief excitation followed by feedforward inhibition. This input appeared to arise from external tufted cells and possibly from tufted cells, and it effectively reset the phase of spontaneous spiking, rather than changing the firing rate. GL-dSAC firing rate was increased by cholinergic input, however. Optical stimulation of channelrhodopsin-expressing GL-dSACs evoked short-latency GABAergic PSPs in periglomerular cells and in external tufted cells. Mitral cells rarely responded to GL-dSAC activation, but short-latency, long-lasting inhibitory currents were elicited in tufted cells. These long-lasting currents showed pronounced depression when GL-dSACs were stimulated at theta frequency, and when GL-dSAC activation followed activation of sensory afferents, tufted cell firing was truncated. These results indicate that GL-dSACs receive convergent inputs from several glomeruli, as well as cholinergic afferents, and they in turn affect the spike pattern of tufted cells. The identification of chrna2 as a GL-dSAC-specific marker will now allow future investigation of these cells' function through optogenetic and chemogenetic manipulation in vitro and in vivo. Heleen A. Slagter, Ali Mazaheri, Leon C. Reteig, Ruud Smolders, Martijn Figee, et al. Consciousness is thought to stem from activation of broad areas of cortex. Tasks in which a given stimulus is consciously perceived only on some trials have suggested that activation of temporo-parietal-occipital regions is necessary and sufficient for conscious experience. Although activation of other cortical areas, particularly the prefrontal cortex, is often associated with conscious perception, this activity is thought to be a prerequisite for conscious perception, rather than creating the experience itself. Whether subcortical structures also contribute to conscious experience has been unclear, because activation of these structures is difficult to detect noninvasively. But with the help of patients undergoing electrode placement for deep brain stimulation, Slagter et al. have now found evidence supporting a role for the ventral striatum in conscious perception. Patients viewed a stream of characters that included letters, symbols, and two digits, after which they were asked to report the two digits. In such a task, subjects often miss the second digit (T2) if it is presented 200–500 ms after the first (T1). Thus, one can identify neural correlates of conscious perception by comparing activity on trials in which T2 was perceived to activity on trials in which T2 was missed. This comparison indicated that oscillatory activity in the alpha and low-beta range (8–16 Hz) increased in the left ventral striatum 80–140 ms after T1 onset only in trials on which T2 was not detected. When T2 was detected, theta-range (4–8 Hz) oscillatory activity increased in the left ventral striatum 200–400 ms after target onset. A similar increase in theta activity occurred after T1 onset, regardless of whether T2 was perceived. These results suggest that activity in the ventral striatum influences whether a stimulus is consciously perceived. Specifically, a stimulus may need to evoke theta-range activity in the striatum before it can reach consciousness. In contrast, alpha and low-beta activity preceding stimulus presentation might hinder conscious perception. The fact that alpha and low-beta power did not increase after all stimuli suggests that this increase was not driven by T1. Instead, it might reflect ongoing, intrinsic fluctuations in attentional state. Future work in which attention and expectation are manipulated should help to elucidate how striatal activity affects consciousness.